No, all of our content and exam taking process is online. 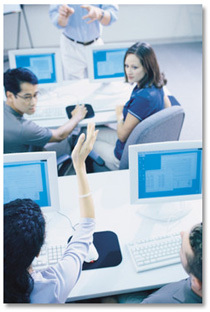 Once you purchase your program online, you can take your courses from any computer that has internet access. My training will not start or open or I hear clicking but then nothing happens. Does your site keep track of my score and timing? Yes. Our site keeps track of your courses and every exam you take, the answers that you select, and the scores for each exam. It also gives you performance benchmarks and lets you know how you are doing in all areas. How often can I review my course? As often as you like from any computer with internet access. Please keep in mind your program may have an expiration date. If you need an extension email your request to wirtc@wirtc.com. No. An exam cannot be paused at any time for later use. Please take the exam when you will be free from interuptions.